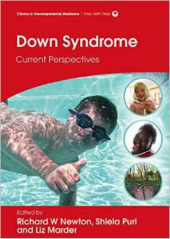 At all ages people with Down syndrome are at risk for neurological problems caused by cervical spine disorders. In childhood craniovertebral instability is the predominant issue occurring in between 10- 20% of children with Down syndrome and though symptomatic instability only occurs in approximately 1%, the rare but potentially devastating consequences of cervical spine subluxation are well documented. Identifying those at risk is not straightforward. Routine X ray screening is not recommended as X rays have poor predictive value and can be difficult to interpret. Emphasis is therefore on recognizing potential warning symptoms of craniovertebral instability (which usually has an insidious onset) as these are the most useful predictors of future risk and merit urgent referral. Definitive management is surgical fusion and increasingly good outcomes are reported with timely intervention in experienced neurosurgical units. Anaesthetists and ambulance personnel should to take into account that unconscious children with Down syndrome may be at increased risk of cervical spine injury, especially if they have warning signs of potential craniovertebral instability. Pre-operative X rays in asymptomatic children are not indicated. People with Down syndrome should not be barred from any sporting activities, as there is no evidence that asymptomatic individuals are more at risk of cervical spine injury than the general population. Clinical screening criteria have been developed by the British Gymnastics Association for specialized sports such as trampolining.